Thomas Hewes Hinckley was born in Milton, Massachusetts, in 1813. (1) Although he lived in the same house all of his life, Hinckley did travel widely from California to Europe. This desire to travel may have been inherited from his seafaring father. Robert Hinckley was a sea captain of a transatlantic vessel that sailed from Boston to London. 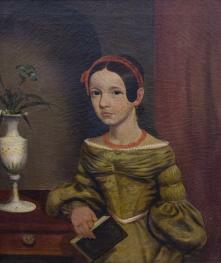 Although Thomas expressed an early interest in becoming an artist, his disapproving father sent him to Philadelphia to be a merchant’s apprentice in 1829. Unknown to his father, while in Philadelphia, he took evening classes in drawing from William Mason; this was his only training. After Captain Hinckley died in 1833, Thomas Hinckley returned to Milton. Determined to be an artist, he began by painting signs and portraits. He soon turned his artistic attention to painting animals, and his first animal picture to gain attention was A Setter and Pups of 1843. (2) By 1845, his animal paintings were selling well enough for him to be able to establish a studio, and he became famous for his cattle paintings. Hinckley produced twenty to twenty-five paintings a year, and at the end of his life there were an estimated 478 paintings signed by him. In 1851, Hinckley visited Europe, and there he admired the work of British animal painter William Landseer, as well as the Flemish masters. In 1858, he exhibited two of his hunting scenes at the Royal Academy in London. He also exhibited at the Pennsylvania Academy of Fine Arts and the National Academy of Design. In the 1870s, he traveled to California to paint deer and elk in their natural habitats. Hinckley painted to the end of his life, and he died in Milton in 1896. 1. Biographical information taken from the following: Marjorie Shaw, Thomas Hewes Hinckley: Artist to a Generation (Milton, MA: Milton Historical Society, 1985); Edan Milton Hughes, Artists in California 1786-1940 (San Francisco: Hughes Publishing Company, 1989), p. 258; Clara Endicott Sears, Highlights Among the Hudson River Artists (Port Washington, NY: Kennikat Press, 1968), pp. 176-178; and Michael David Zellman, American Art Analogue (New York: Chelsea House Publishers, 1986), p. 160. 2. Apparently, he had been interested in animals from an early age; Sears notes that two drawings of a pig and a dog were found among Thomas’s father’s papers.